Today Google updated the stable version of its Chrome browser to version 36.0.1985.122 on Windows, OS X, and Linux. The update contains a couple of visual changes as well as some under the hood improvements. Below is the full list of changes provided by Google. The first two listed changes are mainly visual. 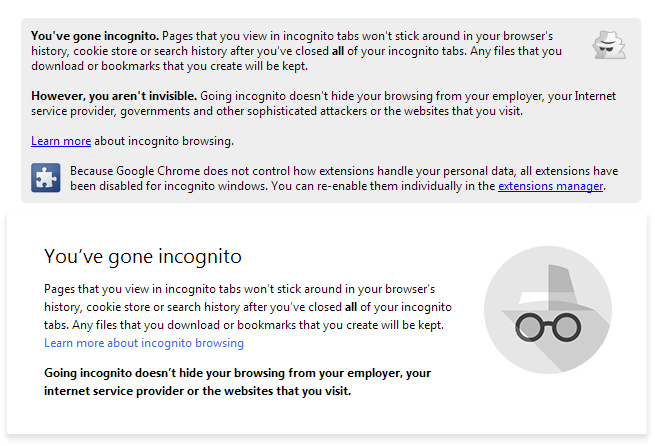 The changes to the incognito tab landing page update the design of the disclaimer about incognito mode to better fit in with Google's new Material Design principles. Below we have the old landing page text on the top and the new design on the bottom. As you can see, the new design employs a greater use of white backgrounds with a shadow underneath the card. This release also brings the Chrome App Launcher to Linux, having previously been a feature only included with Chrome for Windows and OS X. The remaining browser changes are mainly under the hood to improve stability and performance. Upon updating my copy of Chrome for Windows to version 36 my Adblock Plus addon was unable to restore my custom website filters and so Adblock Plus users with custom filter lists may want to take note of any customizations they have made prior to updating. In addition to the changes listed in Google's changelog, the update includes fixes for 26 security issues. More information about these and other changes to Chrome can be found on the Google Chrome blog below. Update: Google is now rolling out the same 36.0.1985.122 update to Chrome for Android. The specific changelog for that update is listed below. In addition to these changes, the update contains some security fixes specific to the Android version of Chrome. That only ends up replacing the notification icon with the overflow/hidden icon so no, it doesn't solve the issue. Luckily Chrome 27 works perfectly fine without the annoying notification bell, as well as giving me the option of having tightly spaced menus that don't boil my eyeballs with their stark white background.